This is one of our favorite love stories! A Town Like Alice tells the story of a woman who falls in love with an Australian man, and of their overcoming great odds to be together, and make a life for themselves in Australia. A Town Like Alice is a novel by the English author Nevil Shute. It was first published in 1950. The "Alice" in the title refers to the town Alice Springs, Australia. It was made into a motion picture in 1956 starring Virginia McKenna and Peter Finch. In 1981, A Town Like Alice was adapted into a popular television mini-series, starring Helen Morse and Bryan Brown. Elements of this fictional story involving a group of English women are based on the true events which happened to a group of Dutch women in the Second World War, although the actual events transpired in Sumatra rather than in Malaya. Shute met one of these women, Mrs Geysel, after the war and wrote A Town Like Alice as a tribute to her courage and fortitude. Plot summary: A few years after World War Two, a young woman, Jean Paget, who was working in Malaya when the Japanese invaded, recounts to her London lawyer the story of her time in Malaya during the war: She is one of a party of European women who were marched around Malaya by the Japanese, since no camp would take them in and the Japanese army would not take responsibility for them. Many of them die on the march, and the rest survive only by the charity of the local villagers. On their march from one village to another, she meets a young Australian soldier, Joe Harman, also a prisoner. He steals food and medicines to help the women, and is brutally punished by the Japanese authorities. The women are marched away believing that Joe has died. Jean survives the war and returns to London. A few years later, she unexpectedly inherits a substantial amount of money from a distant relative. 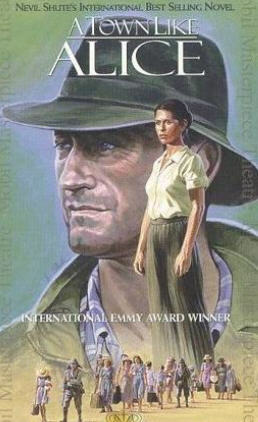 She discusses the matter with her lawyer, Noel Strachan, and decides to return to Malaya to attempt to help the people in a village who sheltered them. When she arrives, she learns that Joe Harman survived his punishment and returned to Australia. 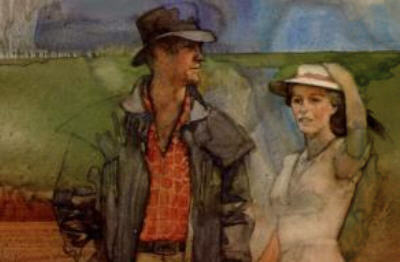 She travels on to Australia and visits the town of Alice Springs, where Joe lived before the war. She then travels to the Outback Queensland town of Willstown, where Joe has become manager of a cattle station. - But in the meantime, Joe has learned that Jean survived the war and is unmarried, and so he has drawn down money he won in the state lottery in order to travel to England in search of her, but in vain. On her lawyer's advice, he returns to Queensland and they are finally reunited. Joe and Jean eventually decide to marry. Using her inheritance, Jean helps to build the small outback town of Willstown into a place where people would like to live - a town like Alice Springs.